This Belleek basket features blossoming roses along with a butterfly and a shamrock. 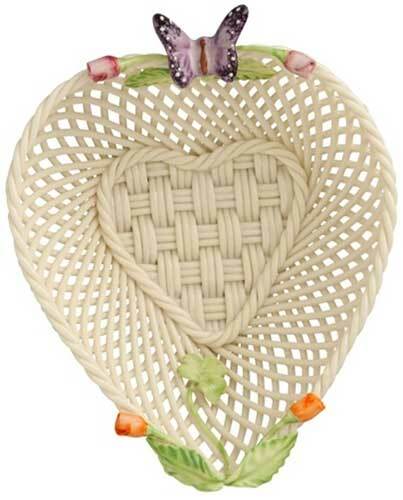 The heart shaped Irish basket is woven of fine china with individually applied leaves and petals. The Belleek China basket measures 4" wide x 5" long x 2” deep and it is hand painted and handmade in Belleek, Ireland. 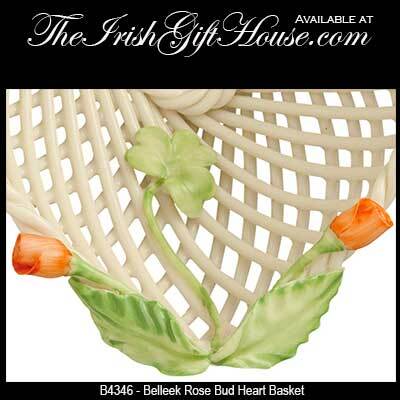 The Belleek rose bud heart basket is received gift boxed with a shamrock history card, complements of The Irish Gift House. The Belleek rose bud heart basket repeats the basket weave heart design at the base of the basket.